As students head back to school in the coming weeks, Amazon is looking to take some of the pain out of buying books with an all new textbook rental service. 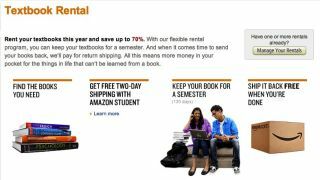 Amazon already offers rentals on certain digital textbooks through the Kindle, but that service got an upgrade Monday as students got the option to rent paperback and hardcover books from the site for a semester. Students can expect to save up to 70 percent on rental books, which are lent out for a full semester, or 130 days. Both new and used textbooks will be shipped based on availability, with all used books guaranteed in "acceptable rental condition." Amazon plans to charge late books a 15-day extension fee and the full price of the book after that. Students should also note that additional charges can apply for "excessive writing or highlighting" in the rented texts. Amazon is no stranger to students and the books they need for classes and has been offering a textbook buyback program for several years. However, with many books depreciating in value as new editions are published, semester rentals are an increasingly attractive service for students. Half.com also offers a similar textbook rental service, with the added flexibility to rent for either 30 or 125 days at a time. Amazon's own Kindle textbook rental service also offers more flexible scheduling, with the option to rent a book for between 30 and 360 days. This is only the first school year Amazon has offered physical textbook rentals, so the service will likely evolve in future terms. In the meantime, it will at least help save everyone from college-bound teens to super seniors to returning students from the price gauging at their campus bookstores.